The Idyll of Garturk: The Good, the Bad and the pretty Ugly, Demons (A novel in 3 parts) by Fyodor Dostoevsky. The Good, the Bad and the pretty Ugly, Demons (A novel in 3 parts) by Fyodor Dostoevsky. A mountain climbed. It's not so much the 750 pages (with 35 page appendix) or the dense text but finishing this book really feels like an achievement of that magnitude. But also like that task you wonder why you did it. "Because it was there" doesn't seem like a good enough reason. On the face of it this is not a novel that should attract me - it is in (large) part a polemic of Dostoevsky against "radical" groups - their ideology, membership, leaders and purpose. Further it essentially is novel of ideas - which is a big ask over hundreds of pages. Other writer/philosophers like Sartre and Camus hone their narrative philosophical fiction over much smaller length. And yes these are problems - I will expand on this later- but I stuck with it. In a lesser writer's hands this whole project would fall apart. Ultimately the study of character and quality of prose shine through. But there are problems and an underlying tone of nastiness that sticks to you as reading. Russia in the 19th Century was a society of massive contradictions. A huge land of feudalism amongst the sea of pioneering capitalist states. Slavery or Serfdom abolished in 1861 (on a par with the American Civil War) - but a massively stratified society meant the vast majority of the populace lived in grinding poverty with no prospect of escape. However the elite of Russian society had different options. Most attached themselves to the Tsarist regime and attempted to give it a liberal sheen - fuelled by trips across the European continent. A small section though were attracted to other European phenomena like revolutions and democratic change. From this grew a myriad of small groups with "revolutionary" aims. As they operated in a police state and were (largely) from the upper echelons of society their influences and ideas were all over the place. Anarchism and individual acts of heroism./terror (based on perspective) were particularly strong in such a context. Bakunin (born in 1814) and Herzen (born in 1812) were two of the key figures. Assassinations (successful and attempts) were very common - even the act of creating a work of art or in particular literature could be seen as a revolutionary act against the Russian state, What is to be Done was a very successful novel advocating revolutionary change in Russia - Dostoevsky hated it - a few scenes here are spoofs of that work. Lenin later used the title in partial tribute for one of his key political writings. The absence of large industry and the nature of agricultural peasant life meant that belief in collective action was more theoretical and not central to change in the way Marxist thought envisaged. Russian groups existed with that perspective but they were even smaller and more isolated - it took the 20th Century and mass revolutionary action for these to develop. Dostoevsky obviously knew of this phenomenon because he was part of it. As a member of the Petrashevsky Circle he was exiled to a Siberian prison (after facing mock execution) in 1849. Demons has often been cited as the work that utterly repudiates this past and partly that is true but there is more to it than that. An actual topical incident inspired Dostoevsky the revolutionay Nechayev a follower of Bakunin murdered an associate in his group "People's Vengenence" He fled the country in 1872 but returned and was sentenced to 20 years in jail where he died. Prior to this he had also gained a large inheritance from Herzen to spread revolutionary ideas and published a short pamphlet "The Catcheism of the Revolutionary". Dostoevsky saw this incident as an opportunity to dissect and dismantle the entire Russian radical movement and he didn't limit it to the new generation of radicals which Nechayev represented. Nechayev was actually from a poor ex-serf background - interestingly Dostoevsky choses not to have either of his main protagonists from that stock. He also wanted to expose the ideas underpinning individual revolutionary action as essentially anti- human. Nechayev had written in his pamphlet that a revolutionary has no identity or being at all it was consumed by the one purpose - revolution. Of course these groups were explicitly athiest too - another long-term target of Dost. So he had his targets - yet one of the problems of reading this work now - is the time it takes to make that clear. The actual incident of the internecine killing of an ex-revolutionary (Shatov) now recanting his ideas and the movement occurs well into the 3rd "book" of the novel. Around this a massive artifice is constructed in the rural anonymous Russian town where the work takes place. Bravely and in an interesting narrative device for the 19th century time the first book does not mention or explore the key characters that will emerge later in the work the charismatic villainous "revolutionaries" - Peter Verkhovensky and Stavrogin. In fact you would struggle to identify what the novel was about at all and this is over 200 pages long. This ends fairly abruptly with a confrontation at the end of this part. Modern novels or any other form of narrative art would struggle with the absence of the main "protagonists" from the first third. Although cinema often kills off a main character shockingly early - think Janet Leigh in Psycho - it doesn't often refer to a character off camera for the first third. So Dost was ahead of his time in this area but it does mean the novel has no hook to click onto and means the first part is the hardest slog of the work. It asks a lot of the reader to essentially read the length of one book to establish the premise for a much longer work and even then it is hidden given it focuses on the machinations of underground radicals. I don't think this was purely a narrative trick for FD though. The focus on the first part of the work is on (confusingly) the father of Verkhovensky and the mother of Stavrogin. He (Stepan)was a teacher to Stavrogin and she is a local widowed landowner. Stepan was/is a contemporary of Dostoevsky himself and held radical ideas then but is appalled by reports of what is now going on. The mum is a Europhile and devoted to her son. The two have an unrequited/sad and quite destructive relationship. It is clear that put bluntly Dostoevesky blames the parents and indirectly the intellectual milieu of the early 19th Century for creating these immoral empty violent revolutionaries. Stepanlitters his speech with French - to a ludicrous extent by the end. As the work develops it becomes clear that Stavrogin and Peter V have returned to the town to kill Shatov - the underground printer desperate to recant his previously held views. Or rather Peter V will mobilise the rag-tag secret "group of 5" who live in the town - underground radicals. This emerges as they both destabilise the town by enthralling and splintering the local elite - particularly around the Russo-German Governor and his wife. This part is also pretty complex - and you can see why the edition I read had a list of characters with full Russian names to keep track. It also exposes another problem in the work - the narration. There is an identified narrator (Stepan's friend) who I think is meant to be some sort of moral observer of events. However it is unclear to me how he knows everything that was going on - particularly as the work becomes more and more complex and delving into the underground. Complex as the artifice is the essence of the work I think is the question of what sort of character do you have to be a revolutionary like Nechayev in the real world or Stavrogin and Verkhovensky? Dostoevesky is pretty clear - you have to be a villainous psychopath incapable or uncaring of feeling - love or otherwise. In the creation of a bad guy Dostoevsky with his masterful skills of describing the characters of humans has come up with one of the best literary examples I would say with Peter Verkhovensky. Duplicitous, charming and ruthless - he sees the opportunity of the underground revolutionary movement for him to dominate and control others and create general chaos in broader society. It is him that organises the killing of Shatov and takes the lead on coordinating the group of 5 and seducing (not literally I don't think) the governor's wife. Dostoevsky even wrote a chapter which has Stavrogin in quite explicit language for the time confessing to a monk of his child abuse of a young girl in Petrograd. The editors thought this was a step too far and it was removed. It is contained as an appendix here in this addition So a psychopath, narcissist, satyr and a peadophile! Hardly subtle. Of course modern critics and opponents of what happened in Russia 50 years later with the October Revolution have stated this shows Dostoevsky's foresight - that only dangerous and isolated characters are attracted to revolution and in particular revolutionary organisations. There is a point that subterfuge and small groups (not necessarily left wing or even political ones) attract people who have their own issues. It may allow them to dominate and exploit but the specific characterisation of these two who could be defined as the leadership goes over the top to express this point. Indeed you could go further and state that the Left in particular have (or perhaps had) an obsession with gaining a charismatic leader who could advance ideas. You don't have to go very far to see that as I know in Scotland. Indeed Peter envisages Stravogin for that role (their own relationship is pretty spikey) - linking him to Ivan Tserevich - a significant figure in Russian folk history/mythology. But Dostoevsky's point is much more than this. It is essentially that the act of wanting to change a society and having a vision or ideology is in itself worse than any society you would be fighting against. Modern political philosopher John Gray essentially endorses and underpins this position. FD's position is made clear not so much by his portrayal of the two protagonists but of the ordinary Russians who make up the radical group manipulated by Peter V- local functionaries, students, midwifes, teachers. The contempt for their attempts to alter the way they live drips from the prose - portraying them all (without exception) as witless or arrogant or boring or buffoons. There is one scene where a group of disgruntled workers from a nearby factory approach the local governor and he sends the army to whip them. This is exploited by Peter V for his own ends. However the way it is written sneers at the reporting of a political protest and the overreaction of describing it as brutal. I think it is clear Dostoevsky believes the act of collective protest against a regime like post-serfdom Tsarist Russia is worse than acceptance of it. It is in another artistic universe to the prose of FD but I was reminded a little of the lightweight drama concocted by Liverpudlian TV writer Alan Bleasdale in the early 1990s - GBH. It was in part a political hatchet job on the struggle on Liverpool Council and the Militant in the 80s - however it became more than that. It was actually an attack on those who would challenge authority - they are as bad as the ruling elite and attract the dislocated and dangerous. The plot of GBH sort of collapsed in on itself outlining the similarities between the rebels and the ruling class. The historic role of those who struggled for democratic, feminist and socialist ideals in the Russian police state of the 19th Century is boiled down to a psychological disorder or as an enablers of psycopaths and dictators. Which probably was Dostoevsky's position. However it is a scattergun approach which feeds into the sprawling nature of the work. Noone who has touched radical ideas in any sense is safe. He mercilessly lampoons his contemporary Ivan Turgenev through the character Karmazinov as a pompous hypocrite feeding into the underground movement but distancing himself from it by planning to live abroad. He attacks the Germanic Governor and his wife for facilitating Peter V and his more open and acceptably liberal arguments which for FD are only used as a front for the destruction of society by more revolutionary methods. This is symbolised by a literary gala day and dance which is meant to use liberal art education to help the masses of the town and stop revolutionary ideas spreading organised by the Governor's wife. Of course this is manipulated by Peter V and becomes a shambles culminating in utter disaster - a well written few chapters. FD comes close to putting the case through the prose that any form of liberalism in Russia encourages the more dangerous elements that he dissects - hence his savaging of Stepan and Stravogin's mother. The true radicalism comes from internal individualism - most notably an individual's relationship with God. There are no real heroes in this book which in and of itself I don't have a problem with in fiction but it does mean you struggle to get a grip of the moral centre of this work. The closest apart from the frustrating narrator and the renegade Shatov (who lambasts Stravogin in one chapter over his abandonment of God) is a character called Kirillov. He like Shatov is distancing himself from the "group" but has internalised it. He plans to kill himself - allowing a few very Dostoevskian passages on the nature of suicide and its relationship to religion and existence. Peter V hopes to exploit this and persuade Kirillov to admit to the killing of Shatov in his suicide note - thus saving all the other murderers. It is quite a violent work which fits in generally with the themes and the murder of Shatov has predictably bloody consequences. The corpses pile up pretty quickly by the end of the work. So is it worth it? 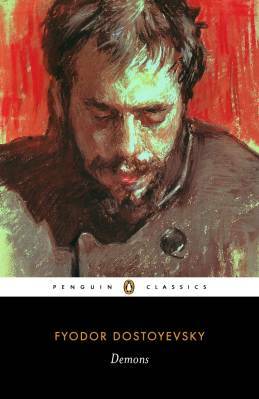 Well the characterisation is impressive and although Dostoevsky is polemical his writings on the nature of humans - even when he is attempting to caricature them is impressive. Some of the quieter scenes for example on the relationship between Stepan and Stravogin's mother are really good. The prose and senses of people will stay with you if you can stay the course for the work. It is long though with many chapters essentially philosophical discourses through the medium of conversations. Overall though I think the settling of scores and the polemic against radical change overbalances the work as a whole. You can see why critics of the left or specifically revolutionary change use this work to show the innate danger of such ideas but this work itself is one-sided - quite deliberately so. Dostoevsky's shift to supporting the status quo in Russia was as much an inspiration for this book as his attempt to expose the anarcho-individualist actions of the Russia Underground and the radical movement. This book though long, difficult and ultimately flawed will still cause disputes, discussions and fights among those who read it and 150 years on I would say that is some achievement. Tenuous Politics Football World Cup 2018 : Semi Final 1! The Girl With the Dragon Tattoo - unconvincing. Rosencrantz and Guildenstern are...Stonemouth by Iain Banks. A 40 ish socialist with 2 offspring who has managed to bluff his way through the intersection of law and education.